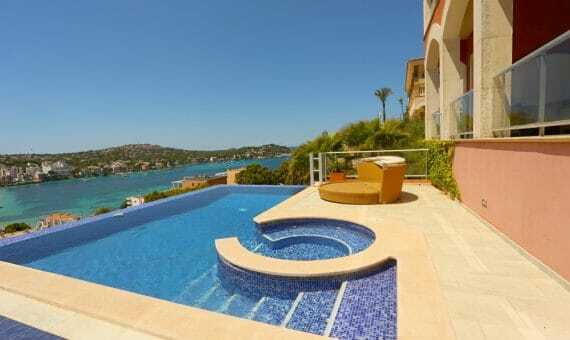 The modern new house with panoramic sea view in Santa Ponsa, Majorca. The villa has been recently finished and is situated in the center near a beach and shopping streets. The spacious villa shares on the big light salon-dining room with an exit to a wide terrace with a view of the sea, modern separate kitchen, 4 bedrooms and 5 bathrooms (4 en suite). Among other characteristics of the magnificent house in Santa Ponsa marble floors with heating and air conditioner (cold/heat) are installed. Besides, the house possesses several parking spaces and is on sale completely arranged with furniture.